When Pam discovers an ad in the newspaper advertising for "a worthy heir" to inherit Fiona Bainbridge's millions, she jumps at the chance that will allow Tom to be back under a doctor's care. After all, it was Fiona's company, Bainbridge Corporation, that caused Tom's problems in the first place. Reese Bainbridge, Fiona's grandson, who has refused to have anything to do with Bainbridge Corporation, quickly returns home when he discovers that his fanatical grandmother has run an ad in the newspaper for someone to replace him as her heir. His frustration with his grandmother grows much stronger when he discovers she has moved the beautiful, voluptuous, green-eyed blonde and her freeloading brother into the house that he's supposed to inherit. "I just had to write and tell you how much I enjoyed your book. It was light-hearted and fun, made me want to just keep turning those pages! And hey! That's what it's all about—right? Keep up the good work!" "Lushly curved Heroine. 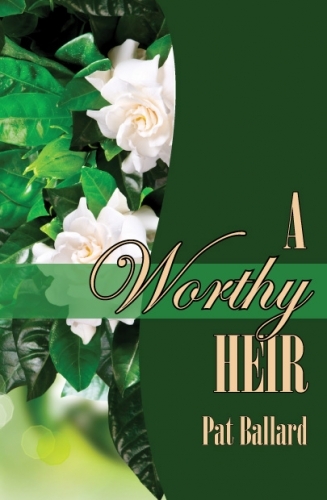 A Worthy Heir is a touching novel; a solid read for anyone interested in romantic stories about healing damaged family relationships. Though there are some mildly sensual scenes, this book should still appeal to fans of sweet romances." "I like Pat's style of writing because it is simple but very pleasing to read. Pat proves that it doesn't have to take a week to read a book to be able to enjoy it. I don't usually like to read romance books because so much of it is complicated and fabricated. Pat has a way of making it sound real and honest. I have read all of Pat's books and have enjoyed every one of them.